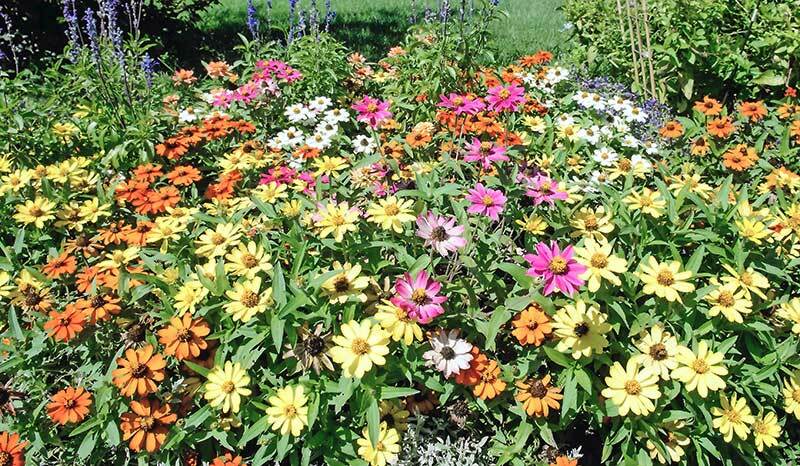 Gardening > A colourful summer garden can be yours! If you’re lucky, you’ll have an area of your garden that gets many hours of sun a day, where you can grow a wide array of plants. In fact some of the loveliest are real sun-lovers, such as many of our favourite fruit, veg and herbs. In my garden the ones that particularly like full sun are easy-to-grow figs, courgettes and rosemary. Mouth-watering goodness that thrives on more than six hours of rays a day to produce bumper crops. As for flower power, turn your attention not just to sun worshippers, but also to drought-tolerant plants. Harsh sun beating down on your garden can mean long periods of dryness, no matter how much you water your plants, so you need to plant accordingly. Poppies, alliums, osteospermum and wallflowers are all so easy-going that they can be left to their own devices – except during exceptionally long periods of dry weather – so they will save you the time and effort involved in getting the hose out yet again! Perhaps you’ve got a wall that simply burns up with heat and warmth on a hot day? There are lots of climbers and wall shrubs that will love it there, not only coping but thriving. Try an exotic Chilean glory flower, which doesn’t need any support and has wonderful red-orange flower tubes – a real talking point. Classic wisteria and clematis are tough nuts and will relish this spot, too. Many plants, however, love sun but will need a much higher volume of water to survive. Summer bedding and sweet peas, for example won’t go long without needing moisture. Remember that anything newly planted will also need a good soaking every couple of days to help it get established. When siting any plant in sunshine, there’s a little trick to help you save water – dig in a lot of compost or mulch, which will act like a sponge and help thesoil retain water for longer. Be vigilant on the watering front with containers situated in sun – unlike plants in your beds, water leaches out ten to the dozen and pots will naturally need more of a moisture boost. Wouldn’t it be great to get that many lovely days this summer that we have to worry about plants getting too dry? Even the tiniest of gardens can attract frogs with a potted pond! Add to your garden’s biodiversity with a home for bees. Hide a home for hedgehogs in your undergrowth. Karen writes for Garden News magazine which is packed full of tips, inspiration, plant and product news and great money-saving offers! On sale every Tuesday, or subscribe and try your first four issues for just £1. Call 01858 438884 or visit www.greatmagazines.co.uk/YFIG. T&Cs apply.